Italy's Minister of the Interior Angelino Alfano is planning to throw citizens in prison if they don't hand over their homes to migrants, according to a report from Italian paper Ilgiornale. Just two weeks ago, a shocking video went viral which showed an 80-year-old Italian businessman named Luigi Fogli being forced by the state to house African migrants in his hotel. Today, we learn the plan is slated to go into hyperdrive come December, though the government is keeping it secret so as not to sway an upcoming referendum which could lead to the ousting of their current pro-migrant invasion prime minister. 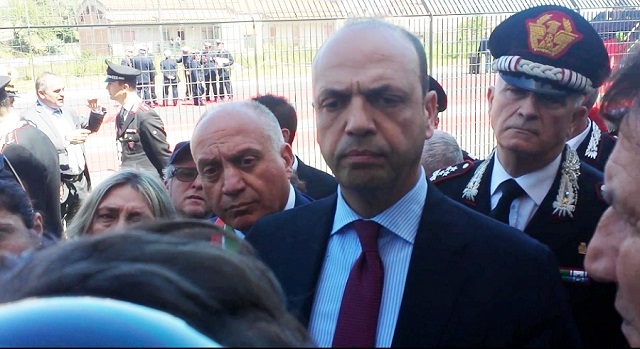 Because it is indeed the protests that worry Alfano. The barricades of Goro and Gorino against the requisition of a hotel in order to place fifteen refugees for days has occupied the front pages of newspapers and embarrassed the government. The secret services have already made a filing on the cities where it is possible for the citizens to organize in committees to resist the refugees. The requisitions in fact, will go forward, and according to l�Opinione, which cites sources in the Interior Ministry, the executive would be ready to take drastic measures against those citizens who would resist the assignment of private real estate to the migrants. �The secret services�, writes the daily, seem to have already alerted the government about eventual violent protests on the part of Italians not disposed to having their property requisitioned. What does it mean? According to l�Opinione the plan, �given the exceptionality of the issue and the reluctance of the Italians to collaborate in the reception�, would be to send at least 2,000 policemen, carabinieri, Guardia di Finanza and soldiers. Not just that: The Justice Ministry would be prepared to outright guarantee rapid trials and detention space for those who resist the Viminale Plan. In substance: jail for those who don�t agree. It appears the requisitions would not be compensated. This is because the Interior Ministry doesn�t have the funds to pay the owners of the homes, given that the money is already committed for the reception of the migrants in the centers operated by Coop and Onlus. In addition, the owner would have to continue to pay IMU and Tasi. In theory they could resort to the courts to obtain compensation/damages, but in this case, the course of justice would be long, with an indeterminate outcome. Also according to the cited source from the Interior Ministry, Alfano�s measure would be �temporary�, but could lead to expropriation, if the property owner took measures that cause �damage to the State�. Indeed, whoever resists risks losing their house forever. According to indiscretions on the part of Viminale employees, the requisition plan would begin at Pescara, a city that would be a sort of test case for the rest of Italy. The objective is to reduce the use of the COOP reception centers because they are more costly and less transparent in respect to the system than those of Sprar. To be affected, second homes would have to be vacant. While it might sound like they're taking your house and giving you nothing in return, the "cultural enrichment" these migrants bring makes it all worth it.